I came across this recipe by Karen Robertson over the weekend and decided to make it for Sunday dinner. It was absolutely delicious. 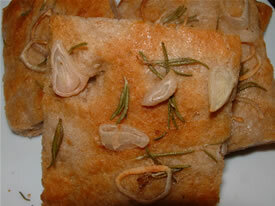 I used teff flour, rubbed it down with olive oil, garlic, and sprinkled it with shallots and fresh rosemary. This is the best focaccia bread I have made. It is fabulous when served with a side of olive oil. Enjoy !